The Libyan Football Federation (LFF) hopes Fifa's current visit to the country will help lift a ban on the North African nation hosting matches. Libyan football was thrown into disarray following a civil war in 2011 which forced the national team to play their matches on foreign soil. 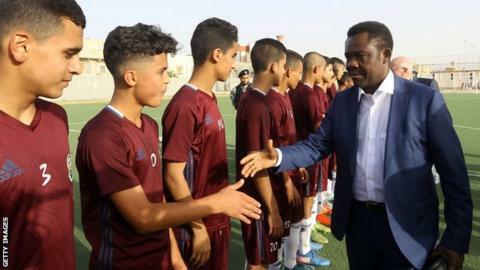 A delegation led by Veron Mosengo-Omba, Fifa's director of African and Caribbean Member Associations, is on a two-day visit to the capital Tripoli - to discuss how football has developed in Libya since the ban. "My presence is the kick-off of the process to bring international football matches (back) in Libya," said Veron Mosengo-Omba. "It is not me who will take the decision, but I will report, because I'm the envoy of the Fifa president. I will address the report of my visit to him, and then the competent body of Fifa will decide how and when to bring international matches in Libya," he added. Libyan clubs have had to use neutral venues to host their matches while the The Mediterranean Knights have played 'home' World Cup and Africa Cup of Nations qualifiers in Mali, Egypt and Tunisia over the last five years. The LFF hopes Fifa's visit can kick-start the rebuilding process for football in the country. "The visit on Wednesday and Thursday aims to support the LFF with Fifa assistance in fields like training and development," a statement from the LFF said. "The delegation will check the security situation in Libya so it can report back positively to Fifa and help lift the stadium ban that has been imposed since 2013," the statement continued. Fifa's Mosengo-Omba says he has been impressed with what he has seen during his time in the country. "We have to congratulate the football family in Libya, despite the difficulties encountered, football is still (being) played. "I was very impressed (between) the gap that we are learning in the newspapers outside (of the country) and the life really that I'm living during my stay here. "I see the people very (much) enjoying football, and the life is good here, and the food is good also," said Fifa's Mosengo-Omba. Despite a domestic league that has been stop-start due to the unrest, Libya qualified for the 2012 Africa Cup of Nations, claimed their first senior African title at the 2014 African Nations Championship (CHAN) and finished third in their 2018 World Cup qualifying group. In February they lost on penalties to Sudan to finish fourth at the 2018 CHAN.